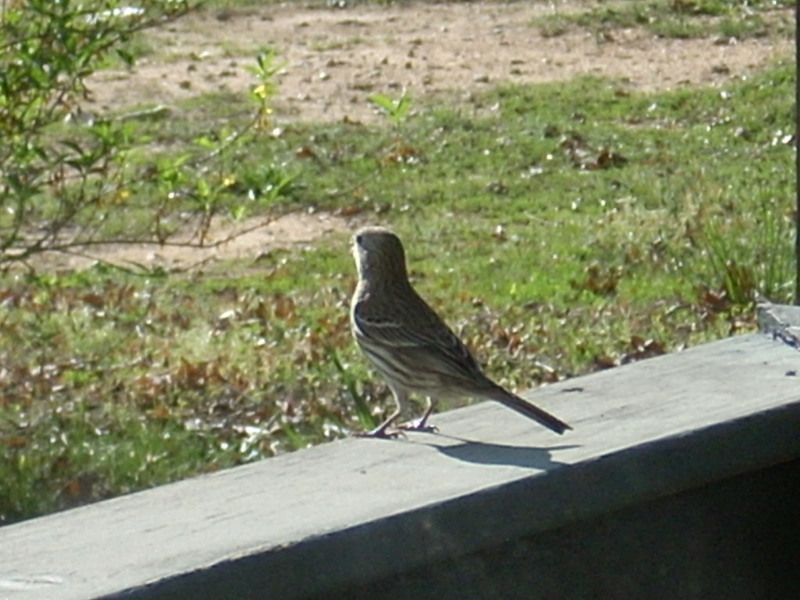 Ma and Pa Finch: Our First Sign of Spring! | "Granny Beads and Grocery Store Feet"
Ma and Pa Finch: Our First Sign of Spring! Ma Finch looking over a likely nesting spot. 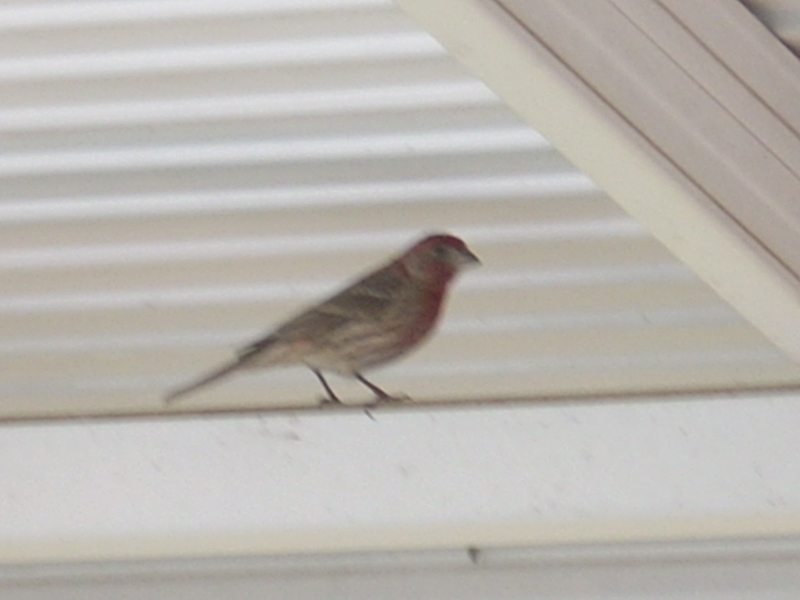 When I went out to get the mail after lunch today, a blur of wings and cheep-cheeped expletives announced what has become the surest sign of spring — Ma and Pa, a pair of beautiful finches, were poking around in the channel beneath our front porch awning for the perfect nesting site. 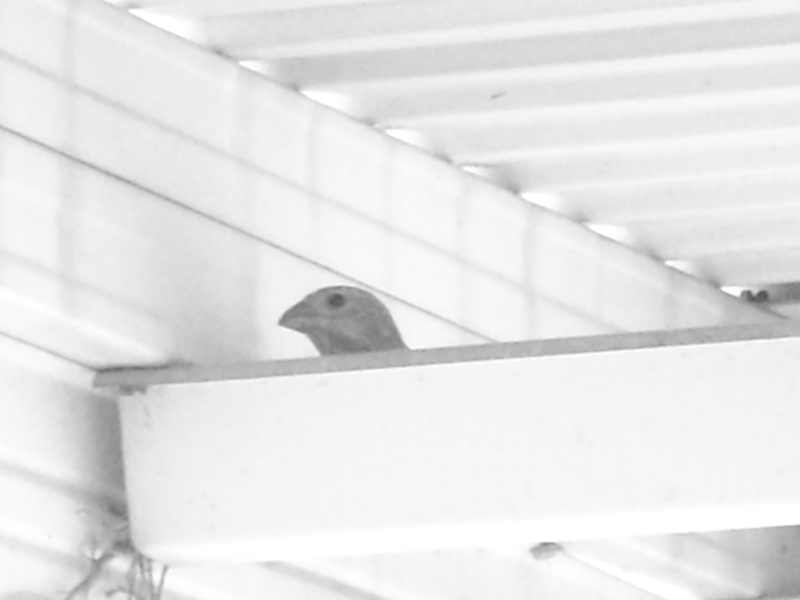 These two may or may not be the exact same pair of birds who have built nests beneath our awnings for the last five years, but I’m relatively certain if they are not the identical two, then they are the offspring of those who have come before. I’ve consulted Peterson’s Field Guide to Birds of Eastern North America and our interlopers are either a pair of house finches or a duo of purple finches. I honestly cannot tell the color plates in the book apart, but then I make no claims to being an expert birder. I do love watching them though. After about ten days, the little ones are fully fledged. Then the sad waiting game begins. At some point, Ma and Pa leave the nest for the comfort of a nearby oak signaling the gravy train and room service have come to an end. Compelled by empty bellies, one by one the little fuzzballs hop up on the edge of the nest and launch themselves skyward. So far — knock wood — we’ve had a 100% success rate with flying. This year’s Ma again. She seems to be checking out the view. Two springs ago, however, we did have our first holdout. He (HAD to be a male I’m sure) was the runt of the nest of five and when Ma and Pa pulled back and the other nestlings left, he decided the newly roomy nest was to his liking and he showed no signs of leaving. For two whole days, he remained in what he’d adopted as his bachelor pad. I figured he would have gotten hungry, but one evening during the holdout, I caught Ma bringing a care package to him. Pa wouldn’t have approved, I’m sure. After two days, however, he must have gotten lonely watching his four siblings swooping through the air nearby. I was lucky enough to be sitting where I had a view as he finally decided to climb to the lip of the only home he’d ever known and launch himself into the blue. It wasn’t the most graceful first flight, but it was enough. Three years ago, we had an awning built over the back deck as well and no sooner had its paint dried than another set of the same species moved in. This location, however, has more in the way of hazards than the front porch; so much so that Budge wants me to put up a rubber snake or something to discourage potential nesters. See, out front, if a little one doesn’t make a successful first flight, we’ve got several azaleas and boxwoods very close by he can climb up in and try once more. Out back though, if he doesn’t get it right the first time, one of two things is going to happen. First, he could land in the pool. For the record, finches swim about as well as I do. If they miss the pool, though and land in the back yard, they have to contend with Keaudie and Jack and while Jack at 14 isn’t nearly as fast as he once was, he can still outrun a fledgeling. Luckily though, we haven’t had any casualties yet. This is Pa from last year. He’s a little blurry because I never could catch him perfectly still. Even as I type this, Ma and Pa are twitching back and forth from one end of the awning to the other. Hopefully, they will take the hint we left them in the form of last year’s nest which sits at the OTHER end of the porch and build down there. I’m sure it will be less stressful for them and I won’t have to worry about losing an eye when Ma goes frailing into the night to protect hearth and home as I try to enter the front door! Hope the weather is treating you great wherever you are and make sure to keep those feet clean!